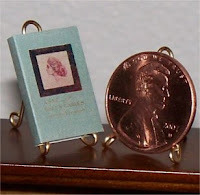 Vast Public Indifference: Tiny Books! I don't have a dollhouse, but I could be persuaded to get one just so I could fill it with tiny books. Miniature Bookshelf has nearly 500 books the size of pennies. Most are classics, but there are a few modern children's best sellers (Harry Potter, A Series of Unfortunate Events). I love the vintage covers. At this point, these are probably the only books I could possibly fit on my shelves.